For homes with large expanses of windows, floor to ceiling glass panels, wraparound sliding doors or any other extensive combination of glass windows and doors, help is here! 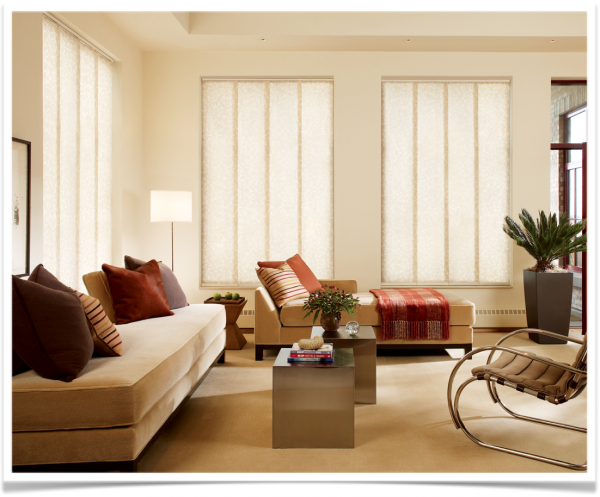 Gliding window panels are a clean, contemporary method of window treatment that allows for complete customization. 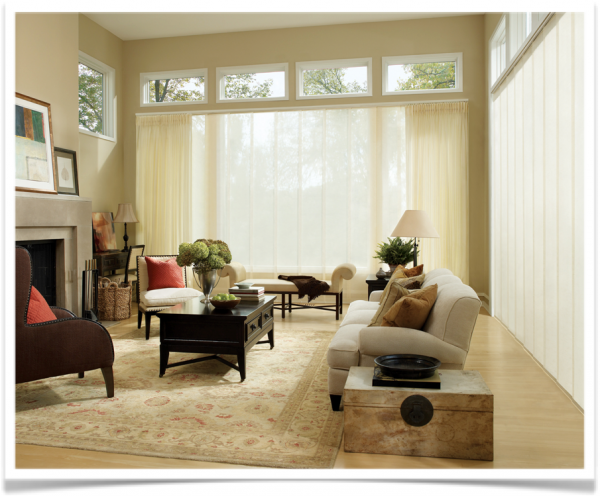 If you’re looking for the most modern window treatments, you’ll find it here. Gliding window panels are operated through a motorized system, moving backward and forward on a track. The track can be created at any length up to 32 feet, which is a great feature for extra large rooms. It can also be 14 feet tall, which is a boon for homeowners with oversized sliding glass doors. The gliding panels can be ordered in hundreds of color options, but they can be further customized for light diffusion. Options range from sheer to opaque. If getting the maximum light is a concern, extra wall space can be dedicated to holding the panels. This way, the gliding window panels can be designed bigger than the window itself. When the shades are fully open, the panels will not block any portion of the window, allowing for 100% of the light to come through. 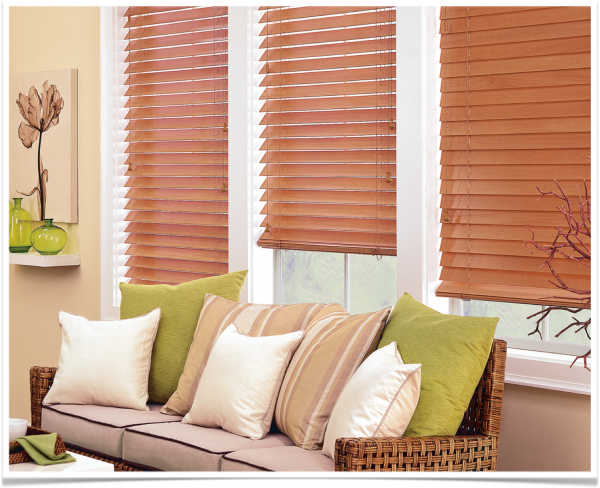 Custom wood blinds are a stylish and tasteful choice for any classic home in Fort Myers or Naples. In this type of window covering, wooden slats are combined to form a blind system that block out a lot of light. Depending on the make and model, a wooden blinds may provide a 95-99% reduction in UV rays. Slats usually come in one inch, two inch or larger sizes. 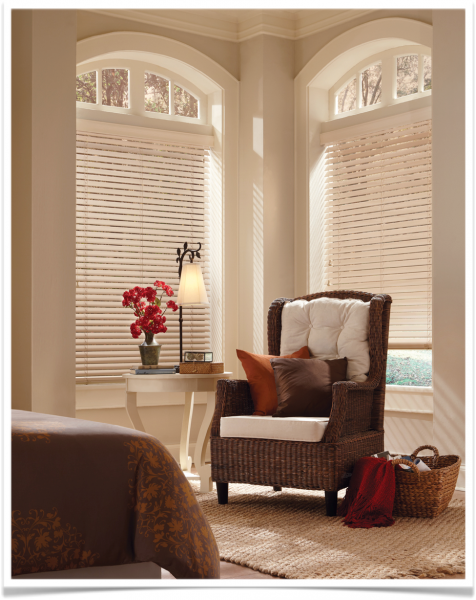 It’s best to choose the size of the wood blind slats with the size of your door or window in mind. Large slats are best suited to large spaces, while small slats look appropriate on tinier windows. Although at first glance, you might feel limited in the available color palette of wood blinds – don’t be! You will probably be surprised to find that wood blinds, especially customized wood blinds, are available in several stains and paint colors. Control mechanisms vary by brand, but two common types are corded styles and wand tilt styles. These are both similar to what you’d find on honeycomb and pleated blinds. It’s a familiar type of adjustment that you’re already used to in other models. © 2011-2019 Beverly Hills Window Tinting, Inc.